Join the Quality Award program staff in this new applicant webinar to learn about program benefits, the criteria and application process for the Bronze award level. The Quality Award team will also announce dates for the 2018 program cycle, recommend helpful AHCA/NCAL resources, and facilitate a question and answer session. Prior to the webinar, we recommend reviewing the 2018 Bronze Application Packet, which is now available on the Quality Award website here. To learn more about the National Quality Award Program, please visit our website or submit questions to qualityaward@ahca.org. 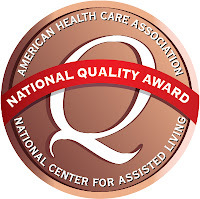 The AHCA/NCAL National Quality Award Program, based on the Baldrige Performance Excellence Framework, recognizes long term and post-acute care member centers and communities nationally that strive for improved quality care. Since 2007, the program has recognized almost 5,000 awards in organizations across all 50 states.